The appearance of cracks in brickwork walls can cause panic to the householder even when fractures are old and settlement or other building movement has long since stopped.­ Fortunately Twistfix have a range of, epoxies,­ wall reinforcement and crack repair products for restoring masonry walls to their pre-cracked state. High tensile helical bars are bonded across the fractures to tie together both parts of the cracked wall for added strength. Epoxy resin crack filler is then injected into the crack to seal and protect the brickwork from moisture ingress and from frost damage. Traditionally wide fissures are injected or filled with polymer modified grouts or dual cartridge epoxy resin systems. However the pasty nature of these fillers makes them unsuitable for penetrating sufficiently into fine hairline cracks in brickwork to form an effective and permanent fill and seal. 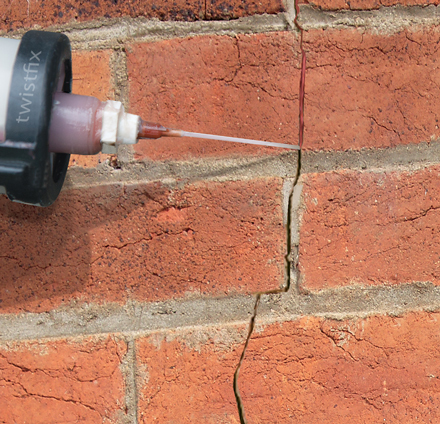 Therefore micro-cracks in masonry and concrete have hitherto been injected with resins that use a complicated, costly and messy injection-port set-up. Not anymore! 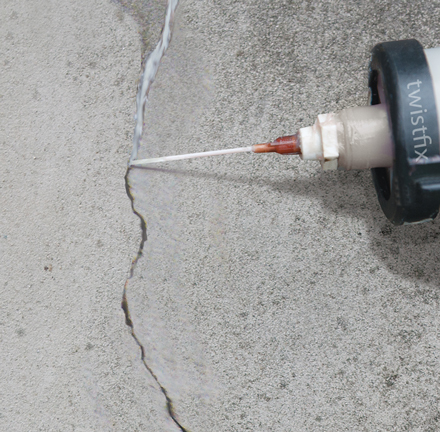 Twistfix has developed a low viscosity resin injection system specifically for filling fine cracks in buildings. 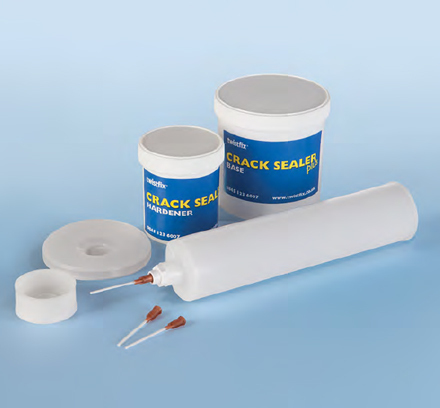 Crack Seal Plus is an epoxy injection system designed to seal micro-cracks in brick, block, stone and concrete. The epoxy crack repair system is supplied in a 300ml kit having two screw cap containers, one contains the base resin the other contains the curing agent. Included in the kit are a follower plate, empty cartridge, outlet adaptor nozzle and 2mm flexible injection nozzles. The crack repair kit has sufficient resin to inject a continuous 30mm deep injection bead along a 5m long crack that is 2mm wide. The crack sealer is available in a brick red colour and a stone / concrete shade of grey. The unique flexible ‘needle-like’ injection nozzles allow the crack sealer adhesive to be injected into cracks as little as 2mm wide, without use of messy injection-port set-ups, and to flow into fissures that are just 0.2mm in width. “This is an excellent aesthetic repair product that fillls narrow cracks in brickwork and masonry walls” claims Henry Ollis - Twistfix Technical Director.– “The epoxy resin crack filler is easily workable, thixotropic and provides a sufficiently flexible seal when cured to complement our wall rein­for­cement systems and crack stitching products”.